La Prairie Cellular cream Platinum Rare - At $1000 per 50ml bottle, it is by far the most expensive beauty cream in the world. With the skin-transforming formula it promises, surely this cream would make me by far the most beautiful woman in the eyes of my beloved. A Hideaway Treat for two at Boracay - It would be a good way to treat my partner like royalty. Six years as a couple, gone are the "just the two of us" days, dim lights and soft music. A romantic hideaway is what we really need! A journal - in which to document my love story--how the heavens turned and planets revoled to lead us to each other's path and sparkle the love we now share. 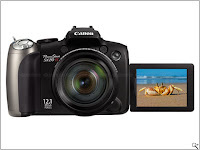 A Canon Powershot - to film this romantic activity and provide snapshots, which we can always go back to. 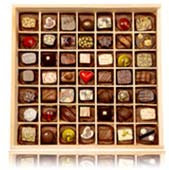 A box of Cacao Fine Chocolates - with which to spoil him in indulgence while alone in our room. Reminiscing the old times and the romantic activities we'll have over chocolates would be a good way to way to unwind and relax in the evening.